Kathleen Wakefield began her writing career by producing song lyrics for Motown Records. She has since worked in film and television and has written stories that have appeared in such journals as Alaska Quarterly Review, Salmagundi, Tabula Rasa, and West Branch. Wakefield's most recent work is her novel Snaketown (2010), portraying a community at the rim of the high desert. The book was published to considerable acclaim and also won the Ruthanne Wiley Memorial Novella contest. Fellow author Steve Lattimore comments: "This story of a crumbling community clinging to a rock, its people flawed and haunted and kin to us all, is an experience so vivid, so terrifying, and so compelling that I fear part of me will be stuck there forever. A work of rare beauty, it's art and storytelling of the highest order." 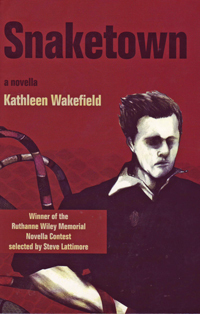 For more information on this author go to http://www.kathleenwakefield.com/main.html.